And this was a quiet day, or so we were told. Photoshop removed some of the pollution, but couldn't do more. That was very clever of photoshop but does mean that you saw it with the pollution! All those people! Very beautiful! @maggiemae Yep. As you'd expect the effect thinned out a fair bit as you got right up close. Just wanted to post one un-Photoshopped version of the ghastly stuff that passes for air there. The crowds are part of the story in this scene/image. Brilliant that you were able to see this in person! Oh, wow - so iconic, even if crowded with pollution. Amazing, to see this in person. @taffy I'm very pleased to have seen this wonderful complex at first-hand, it is truly amazing in a whole bunch of ways. But I absolutely hate crowds and tend to get a bit agitated. We get crowds here in Oz too, of course, and I don't like them either, but as a generalisation Aussies have a pretty generous notion of personal space unlike Asians or subcontinentals. @annied Awesome spectacle Annie, gotta be seen to be believed. Pity we couldn't see it more clearly. @rosiekerr I feel very privileged. Goodness me ..Have some friends travelling in India at the moment .. looking forward to their images.. I was talking about it today with my Indian workmate, who said that humour says that people who built this had their hands cut off after the building was complete to prevent them pass the skills on. Yes the crowds add to the story. Like all iconic buildings from around the world, as photographers often we want them clear of people. But my pet hate is seeing a historic building that has modern day cars and vans in front and around it. you did a wonderful job with the photoshopping. the building looks so surreal and the crowd adds authenticity to the story that the image conveys. it seems to me if i try to touch the screen the building will disappear. great shot, marnie. aces! 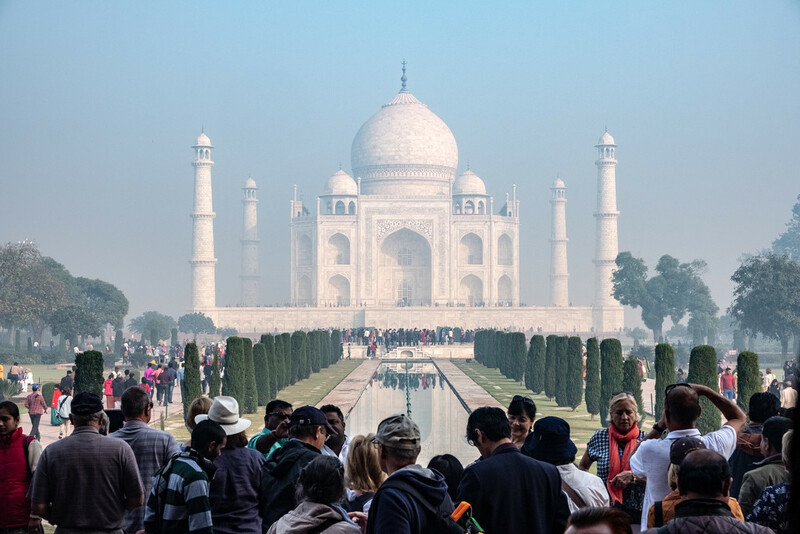 Great image Marnie, I'd love to see the Taj Mahal, but that level of pollution is a bit of a worry! @jgpittenger Yes, I kinda came to that conclusion too thanks Jane. @newbank Thanks Ruth, fabulous place. @onewing Short answer: not as well as I would've coped had there been far, far fewer OP. I do like my space. @julzmaioro That will be interesting. I imagine there are some beautiful unpolluted places in India, but we went to the tourist traps so chockers with OP. @yaorenliu OMG!!! I hadn't heard that one, but could well be true. @followthatdreamphotography I certainly expected a fair few people Michael, but not as many as were there. And, we were told, this was a quiet day. I completely agree re the cars, vans etc. None of them thankfully. @summerfield Thank you so much for your kind comments Vikki. It was amazing to stand in front of this building that we've all seen umpteen times in a picture. @merrelyn It was pretty bad Merrelyn. Les had a hard time with the polluted air in India. @samae Many thanks. Our guide reliably informed us that this was a quiet day. The mist or haze gives this most amazing building a very spiritual quality which is further enhanced by the throngs of people. A most stunning composition. FAV!!!!!!! The haze makes the building almost seem dreamlike. I have heard that about India- so polluted. It's a wonder that anyone wants to vacation there, but I've also heard how far the dollar stretches! Good shot! @joysabin @olivetreeann Thank you both so much, it was an amazing experience despite the problematic bits thereof. @pixiemac I guess so Sarah, but I struggled with the hordes there. So pleased to have seen the Taj Mahal though.